When you decide to play fantasy football, you can join either a public or a private league. Which type you join depends on your skills and experience as a fantasy football coach as well as the number of friends and family you wish to play with. Select the Sports tab from the list of services Yahoo! provides. Select the Fantasy tab on the Sports page. Scroll down to the Fantasy Football box and click on the Sign Up Now link. Select the Join a Basic League link after you get to the sign-up page. This box is opposite the more prominently featured Football Plus box, which is Yahoo!’s pay product. Casual versus competitive: If you just want to play fantasy football to add a little action to your Sunday football viewing, join a casual league. If, however, you’re possessed by the burning desire to crush your opponents and bask in the misery of their defeat, a competitive league is for you. 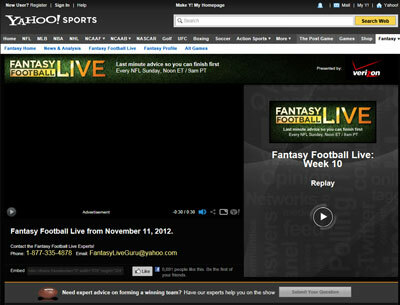 Autodraft versus live online draft: The autodraft feature enables the Yahoo! engine to automatically select the best available player in a random snake draft for your league. Yahoo! has its own pre-ranking system that it uses for this. In a live online draft, each owner goes online at a designated time and all the coaches select players together. Choose your league: A list of open leagues appears, and you can select either a small league or a large one; larger leagues are more challenging. If you’re invited to join a friend’s league, you’ve probably received an e-mail with a link to the sign-up page. Just click on the link, accept your spot, pick a team name and logo, and start talking smack with your pals! If your friend’s league is being set up by invitation only, that makes it a private league. Coaches can join only if they have the league info and password. This type of league works exactly like a public league when the season begins, but the league’s commissioner can customize the setup. Yahoo! has a certain set of standard defaults for roster requirements, scoring, free agency, and so on. The commissioner can decide to alter many of those defaults based on feedback from the other coaches. Some custom leagues have membership requirements or advanced league settings and generally aren’t recommended for beginners. If you have some experience and are looking for a challenge, this is a good way to try out different rules and formats — such as individual defensive player leagues, or auction drafts — that most leagues don’t normally use. When joining a custom league or private league, make sure you know the league make up. Eight to twelve team owners is a good balance talent distribution. Too few owners, and the talent is not distributed enough, and owners will rarely change their lineups. Too many owners, and the good players are spread so thin that basic NFL knowledge will not be enough to evaluate the players you will have to use. The more owners in a league, the more challenging all aspects of the season will be. Also, when joining a private league, make sure everyone in the league is committed to playing for the full season. Nothing can destroy a fantasy league quicker than inactivity. This is an unavoidable risk when joining public leagues as you won’t know the other owners. Some private leagues also have multiyear commitments. “Keeper” style leagues will carry over all or part of a roster from year to year. If you are trying fantasy football for the first time and not sure if you have the passion for it, you may want to steer clear of these style leagues to start with.